BOWMANVILLE, Ontario - Three Compuware Corvette C6.Rs will be vying for the GT1 title in the Grand Prix of Mosport to be contested at Mosport International Raceway in Bowmanville, Ontario, on Sunday, August 26. Former teammates Ron Fellows and Andy Pilgrim will be reunited for the ninth round of the American Le Mans Series at the famed Canadian track near Fellows' home in Mississauga, Ontario. The pair will drive the No. 33 Corvette in bright Arctic White that celebrates the limited edition Ron Fellows ALMS GT1 Champion Corvette Z06. They'll race alongside Corvette Racing regulars Johnny O'Connell and Jan Magnussen in the No. 3 Compuware Corvette C6.R and Oliver Gavin and Olivier Beretta in the No. 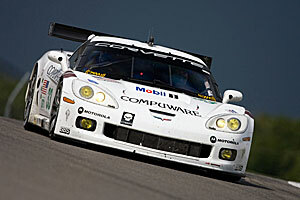 4 Compuware Corvette C6.R on the fast 2.45-mile circuit. Ron Fellows, Andy Pilgrim - C6.R #33 at Mosport "It's going to be good fun, and that's exactly how we're going to approach this race," said Fellows. "Our car will be decked out in brilliant white like the production car. It will be absolutely awesome, and I can't wait." Pilgrim agreed: "It's going to be great racing with Ron as my teammate again," he said. "I want to do well for Ron in front of his home crowd, so I'm going to be trying 110 percent." Fellows and Pilgrim first raced a Corvette together at Mosport in August 2000, finishing second on a track that went from wet to dry in the closing laps. One month later, the pair won at Texas Motor Speedway, scoring the first of Corvette Racing's 59 victories. Pilgrim made 33 starts for Corvette Racing in 1999-2003, notching six victories, posting 18 podium finishes, and winning two poles. "The last time I drove for Corvette Racing was in October 2003 at Petit Le Mans," Pilgrim recalled. "I think the Corvette C6.R is at least five seconds a lap faster than the Corvette C5-R I drove at Mosport, so in a sense it's a completely different class of car. There's going to be very little practice time to get accustomed to its performance, but I'll do my absolute best." Pilgrim and Fellows will be doing double-duty at Mosport, sharing their Corvette C6.R in the two-hour, 45-minute ALMS race on Sunday and driving twin Cadillac CTS- V race cars in a 50-minute SCCA SPEED World Challenge GT sprint race on Saturday. "It will be a very busy weekend for both of us," Fellows noted. "It's a little bit of an adjustment going back and forth between the Corvette C6.R and the Cadillac CTS-V, so we'll have to respect each car's cornering and stopping capabilities." Both Pilgrim and Fellows have been keeping their driving sharp with recent stints in NASCAR road racing competition in Montreal and Watkins Glen, New York. In addition to his promotional and driving responsibilities at the Grand Prix of Mosport, Fellows will also be checking in on the fifth round of the Sunoco Ron Fellows Karting Championship, which will be held on the track's driver development course. The ace Corvette Racing crew will also have the challenge of preparing and servicing a third car at Mosport. "Essentially we'll have all of the equipment to service three race cars in the pits, with separate fuel rigs, separate air guns, and separate nitrogen bottles," explained Corvette Racing program manager Doug Fehan. "We'll use the same crews to service the third car, so we're not going to have all three cars stop simultaneously. We can pit two cars together as we often do, and then pit the third car out of sequence." Corvette Racing's third entry at Mosport will ramp up the competition in the GT1 division, and that's a prospect that the other Corvette drivers relish. "It's going to be great to race against Ron at Mosport," said Gavin, who shares the lead in the GT1 title race with his teammate Beretta. "Nobody knows the track better than he does. We all love Mosport because it's a fantastic place to race." The Grand Prix of Mosport presented by Mobil 1, the ninth round of the 12-race ALMS series, will start at 3 p.m. EDT on Sunday, August 26, and will be broadcast live on SPEED Channel.